It was nice to have a little time off from RISC boxes and the wonderful, crazy world of UNIX. Yet, it does grow on you and you do start to miss that blue and white screen - which is much better than the green and black screen I stared at for the last 6 years. 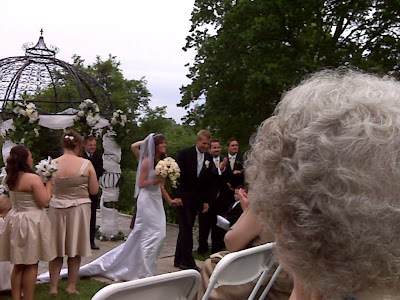 My time off was centered around my sister-in-law's wedding. I took pictures with my phone but resisted the urge to twitpic them. I took a twitter vacation vow and I stuck to it!! After the wedding and the clean up, we spent the rest of the weekend in a recovery coma. We were all whipped from all of the planning and everyone coming to town plus the kids being out of school. It was a pile on that happened all at once. In fact, the kids were off - at home - through Tuesday. I had to take that day off to be on kid patrol. We did catch up on some movies. Family Video came to town (Blockbuster just closed - I'm not sure why I am surprise at that, but I am. When Blockbuster opened in my home town, it was a big deal. Now, they are dinosaurs). Family Video is really cheaper than Redbox since you get 5 nights for next to nothing and Family Video is easier to deal with than the Redbox robot which hardly ever works. "Smart People" - I like Dennis Quaid and just about everyone in this one. It was a bit draggy at times but had some laughs. Worth the $1 rental. 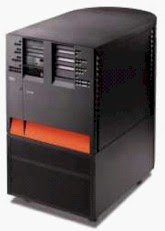 "Be Kind Rewind" - Same as above - a little draggy at times but funny. Worth the $1. "King of California" - this is a Michael Douglas movie about a father returning home from a mental institution who is now obsessed with finding old Spanish gold. It was better than I expected - worth the $1. The ending was weird. Finally, I got to rent "Once". My wife fell asleep 10 minutes in, but I thought it was phenomenal. It's just the kind of movie I like. The music was great. The story was great. In some weird way it reminded me of "Lost in Translation". Well, I give it multiple thumbs up. Quite good. 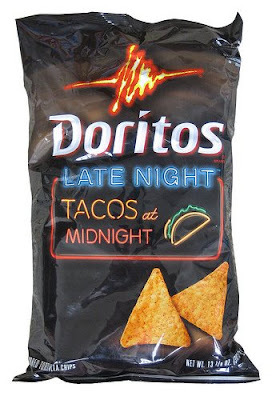 Finally, I discovered "Tacos at Midnight" Doritos. When I opened the bag, I got a whiff of taco sauce smell that took me instantly back to 1991 behind the counter at Taco Bell. Of course, in reality, it smelled like taco sauce and dirty mop water there, but I digress. Then, you bite into the chip, expecting something spicy and get a totally unexpected cheap taco taste. Why I think they are good is beyond me - they really taste like taco sauce powder from an Old El Paso kit poured all over a nacho chip. It's an odd taste - like puffcorn. It's nasty, but good. And, who wouldn't want a product with a tag line like that? What a week! Time for a staycation! New browser. Same old Microsoft. Where would I put it all?